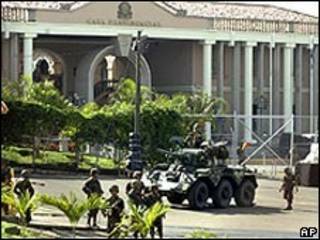 A nationwide curfew is in force in Honduras following the ousting by the military of President Manuel Zelaya. The acting president, Roberto Micheletti, said an election would take place in November as scheduled. A curfew has been imposed across the entire country. All roads are completely deserted of cars. In driving rain only a handful of protestors were left in the streets of the capital. Many Hondurans say there's a total lack of information as to what exactly has happened to their country and their President. Officially Honduras has a new President - Roberto Micheletti is the speaker of the Honduran Congress and, according the constitution, he will remain in power until elections are held. But speaking from exile in Costa Rica, the ousted President Zelaya has indicated he will not be going quietly. He says he was ousted by an illegal coup. His opponents say that his attempts to extend his rule meant that they were legally obligedto remove him from office.